Data is already from a year ago, yet it is still very interesting. It shows very clearly that private debt to gdp is higher in developed countries versus developing countries. This might very well have something to do with property rights. 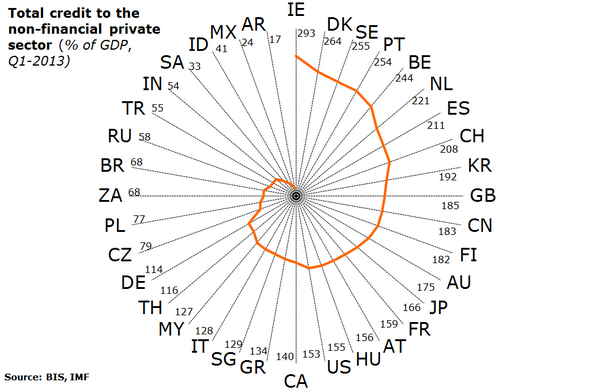 Ireland is clearly on top with almost 300 percent of private debt to GDP. While the Nordic countries are known for their low government debt levels, Denmark and Sweden are second and third in this ranking. Notice Germany which is on the bottom half. Also Italy and Greece are far from the top.